Can you imagine encountering groups of teenagers openly displaying their loaded guns in holsters some future night in Oklahoma City? That could soon be the reality here under a bill sponsored by state Sen. Steve Russell (R-Oklahoma City), pictured right. The bill, if eventually signed into law, would allow anyone 18 years or older to openly carry guns in holsters without a license and without training. The bill passed the Senate in a landslide 36-8 vote. The House yesterday passed an amended version of an open-carry bill that essentially defuses the issue, but now it goes back to Senate. 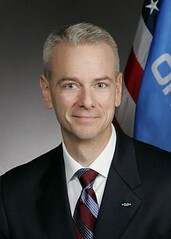 The bill was promoted at least partially as a Second Amendment issue by Russell, according to media reports. It doesn’t allow people to openly carry guns in places that forbid the practice, such as college campuses, but the bill is absolutely unnecessary and problematic. According to the Brady Campaign to Prevent Gun violence, a poll shows that a majority of Americans oppose open carry and believe it would make them feel less safe. That majority probably doesn’t apply here in one of the reddest states in the nation, but there are still many Oklahomans against open carry. Women across all groups oppose open carry broadly – 76 percent of women of color, 68 percent of urban women and older women, 59 percent of suburban women, 55 percent of younger women and a majority of rural women. Will people walking around with visible, loaded weapons here drive away tourists or make some people afraid to go out? That’s entirely possible. It will also lead to more guns on the streets on any given day, and that could lead to more shootings. Police officers might find it difficult to immediately separate the bad guys from the good guys in a crime incident. What about inevitable gun misfirings? Essentially, the open-carry philosophy lacks basic common sense and tacitly promotes gun violence. But this is the way the political winds are blowing on the prairie these days. Does anyone think the Second Amendment extremists will stop with this bill? Will there be attempts in the future-maybe even next year-to allow people to openly carry weapons in all private businesses and public institutions in Oklahoma? Yes. The gun lobby will not stop until openly carried guns, holster or not, are allowed everywhere and there are no licensing, training or background-check requirements for gun owners. This much is certain: The new Oklahoma under complete GOP rule will be armed, dangerous and ready to shoot.